Expert's suggestions on waterfowl guns of YES- teryear aren't all that different from what today's shotgun experts are recommending. Recently I bought a book published in 1934 from Jim Casada, who has been the guru on things historic in the outdoors for several decades. Jim, a long-time outdoor writer, has a Ph. D. in History, and his library of sporting books, especially old classics, is unmatched by anyone I know. Recently, Jim started selling off some of his duplicates, and that's how I plunked down a few dollars for "Guns and Gunning" by Paul Curtis. Paul was the authority on all things gun related during his day, when he was the Gun Editor of Field and Stream magazine for many years, maybe from somewhere around 1919 until the early 1930s. When hostilities broke out between Hitler and England, Curtis headed for the British Isles to volunteer. "Guns and Gunning" was not the first time I came to know Paul Curtis. George Bird Evans introduced me to Paul in his book, "Men Who Shot," in my view one of George's finest works. Evans has a full chapter on Paul Curtis in that book. Reading that chapter it's easy to become totally convinced that this guy was a shooter, had taken truck loads of game, and he knew what he was talking about when it came to all things shotgun. Thus I looked forward with relish to see what Paul Curtis had to say in his chapter titled "Duck Guns and Duck Loads" from that book "Guns and Gunning." He sums up this chapter in the last paragraph with, "If you are one of those who want one gun for all kinds of wildfowling--and the one-gun idea has its advantages, for the one-gun man is often a skillful performer--let it be a 12-bore repeater of some kind, sixty percent choke, weighing 71â„2 pounds and loaded with No. 5 shot. Shooting the country over from coast to coast, Great Lakes to Gulf, under all conditions, this gun will net the greatest number of birds in the long run. Do not overdo either shot size or choke, unless you are an expert." Of course, we have to keep in mind that these suggestions were written long before non-toxic shot had ever been thought of. But Paul Curtis pretty much debunked a Full choke gun, unless the shooter was an expert, and/or the gunning for the day promised to be all long-range stuff. Of the latter he said that long range pass shooting of ducks or geese was the "&apos;¦.very acme of the sport." In these current days I haven't heard of anyone taking two guns to the duck or goose blind, but, evidently, Curtis did just that on more than one occasion. For most of the day's shooting he would pick up the gun similar to the type he recommended in that last paragraph of the chapter, although for Curtis it was much more often a side by side than a repeater. But if a long range chance presented itself, Paul would simply pick out the second gun and put it to work. This second long-range gun I should tell you about. Typically, it would be a double barrel 12 bore weighing heavier at about 81â„2 pounds. The chambers would be 3-inches, and the load would be 13â„8 ounces of No. 4s. His "regular" waterfowl gun would be with 23â„4-inch chambers, and he'd have it fed with 11â„4-ounce of No. 5 or No. 6 shot--at "31â„2 drams velocity." In a 11â„4-ounce load that would be about 1200 feet per second or slightly less. These days a lot of us shoot out of layout binds, and in past columns I've made some suggestions re how to shoot better--after throwing the blind covers back and sitting up. But Curtis makes a suggestion in this context that I did not cover in my column on that subject. Curtis and his cohorts of that day didn't shoot out of ground blinds, but they did a great amount of their shooting out of what they called a "battery." This would be a layout boat weighted down with iron so the gunnels rode almost flush with the water, decoys all around. For this type of shooting Paul was adamant about selecting a "lighter" shotgun, not one of 81â„2 pounds for example. Evidently, he felt that because of the delay in getting ones body sitting upright prior to shooting--that a lighter smoothbore was a big help. For this shooting he suggested a 12-gauge weighing 71â„4 to 71â„2 pounds. Interestingly, for what he called "marsh shooting," which I assume means just what we would think, Curtis suggested smaller 71â„2 shot--because ranges are typically close in this type of shooting--and he considered more pellet coverage important to the ducks so often shot in marsh shooting--which he said were blacks, teal, mallard and sprig. For geese he preferred nothing larger than No. 2 shot, but he felt that No. 4 shot was as good as or better than No. 2s. The fourth paragraph of the chapter spells out Paul's feelings about big guns and big loads. "I have shot ducks from northern Saskatchewan east to Nova Scotia and south to Old Mexico. I have shot point, pass, brush blind, battery and marsh, and I believe I am qualified to say that since most of the sportsmen are seeking greater power and range, the result is that a very considerable majority of them are over-gunned." I say "Amen" to that. Getting specific about his "battery" shooting Paul says, "I have done more deep-water battery shooting than any other kind of waterfowling. Since I adopted a 30-inch barrel weapon, bored to make a 60-percent pattern in the standard 30-inch circle at 40 yards, I have used a load of 11â„4 ounces of chilled sixes, driven by 31â„2 drams of progressive burning powder, and with this gun and load I have killed a higher percentage of my birds than ever before." As already stated, Paul Curtis was a side by side man, although he obviously owned many, many guns. While he spelled out his suggestions for a repeater for waterfowl in that last paragraph in the "Duck Guns and Duck Loads" chapter, he says this about a double gun. "In my opinion, the average man, if he uses a double, should limit it to about 71â„2 pounds weight, not to exceed 73â„4, with 30-inch tubes, bored first barrel 50- to 55-percent or a little better than quarter choke and the second barrel full choke at 75-percent. The gun, of course, should be a 12 bore, as nothing of small gauge really qualifies for wildfowling." Today's most popular repeating shotguns will often come close to the 71â„2-pound 12-bore that Paul Curtis recommends. For example, the Benelli Super Black Eagle hefts 7.3 pounds with 28-inch barrel, the Benelli M2 weighs 7.2 pounds, the Beretta Xtrema will spin a scale needle to 7.8 pounds, the Beretta AL 391 Urika to 7.4 pounds, the Browning Gold Hunter at 7.6 pounds, the Winchester Super X3 at 73â„4 pounds, the Remington CTi 105 at only seven pounds, the Remington 870 at 71â„2 pounds. But you get the picture. These popular wildfowling shotguns are still pretty much in line with the type Paul Curtis suggested over 70 years ago. Italy and England are a bit too pricey to carry into a typical wildfowling situation. The Bobwhite side by side from CZ-USA--12-gauge with 28-inch barrels--weighs seven pounds--plenty light enough--but this one might be a hard kicker with big loads. The side by side from Russia is the Remington SPR 210 model, which also weighs in at seven pounds. Lots of over and under 12 gauges qualify, like the Ruger Red Label All-Weather model--73â„4 pounds with 30-inch barrels, the Canvasback from CZ at 7.3 pounds, the SPR 310 from Remington at 7.5 pounds with 28-inch barrels. There are others. 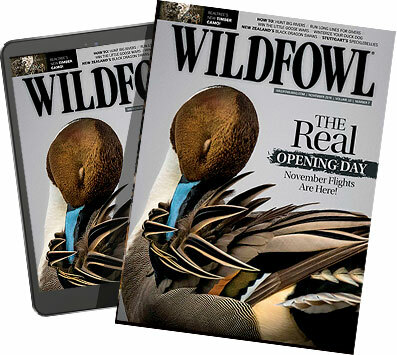 But the main points that Paul Curtis makes about a wildfowl gun still ring true today. Don't select one that's too heavy. Don't select one that's too tightly choked--unless all the birds you are going to be shooting are at extreme range--or you are an expert shot. Finally, don't go overboard with duck or goose loads that are too big--either the charge of shot or the shot size itself. Obviously, when steel shot comes into play we have to change our thinking when it comes to both shot size and the velocity of the charge--since lighter steel pellets lose their velocity so much quicker that lead shot.